This mindset to what I call “promomentumism” is certainly not always fatalistic. However, there comes a theoretical point in most industry maturation curves where the law of diminishing returns becomes the predominant dynamic. Much like an old locomotive that requires a constant shoveling of coal to keep the engine burning, so too does industry require a constant infusion of innovation and thought leadership to keep it optimized for long-term growth. We also understand how deadly the words, “this is the way we’ve always done it” can be. As the economy cycles from growth to recession, back to growth and so on, this attitude in business becomes increasingly toxic with every cycle. We can see this dynamic play out as the building materials industry has experienced at least three distinct periods of purging, or recessions, in the past 30 years, with the last one (2008) being the most intensive. Using the same old strategies can produce level, or even declining, returns and yet, they are omnipresent and pervade. It may not be that the strategy itself is “bad” or wrong, but more likely that it has become ineffective over time. I have coined the phrase, “law of diminishing marginal stimulus” to describe the experiential component behind this phenomenon. When strategies no longer work well, new ones requiring ingenuity, creativity and foresight to identify holes in the marketplace are required to come up with alternatives that work. These new solutions are what I call your driver. Your driving strategy may not be the only or end all, but it must be the one that generates the largest degree of change and new momentum, from which tangent strategies can then spawn. Historically, typical strategies have included new colors, new finishes, new literature, promotions or spiffs, such as small product enhancements, new slogans or affiliations, and yet from the 35,000-foot view, it appears that their collective ability to significantly drive real growth is waning. The surfacing industry has had decades to mature, and from a macro economic perspective, the lack of substantial product or technological innovation, generally yields declining average profit margins. From my perspective, entrepreneurial thinking technological innovation and new sustainable product categories are needed to shift the profit curve upward. Additionally, synergistic alliances (SA) are what I would consider the least expensive, yet highest potential ROI strategy. SA could be inter-company cooperatives, but don’t necessarily have to be. Anything synergistic follows the model that says, “Separately, you and I will win, but together we will be more successful than simply you plus me.” Mathematically expressed it would be: 1 + 1 >2. I have written previously on how the power of synergy can often produce exponential returns greater than a “divide and conquer” type strategy. A poignant example of this dynamic can be seen in the power and energy released in a hydrogen bomb vs. an atomic bomb. An atomic bomb’s energy is derived from the “dividing and conquering” or splitting of atomic particles, a process known as fission. At the instance the particles are split, a small amount of energy is released. This energy is quite powerful and in the aggregate and it can produce devastation as we saw in World War II. That said, there is an alternative nuclear process called fusion that creates energy several orders of magnitude greater. In fact, we are living and breathing today because at our sun’s core, the thermonuclear fusion process occurs billions of times every second. In thermonuclear fusion, atoms collide and fuse. When they fuse they become a new element, and in the process a small amount of energy is released. This residual energy is relatively much more powerful than the energy released in the fission process and this process is used in the detonation of a hydrogen bomb, which is why it will create significantly more energy than an atomic bomb, scientifically demonstrating the power of synthesizing energies (synergy). I have been an integral part (witness and practitioner) of the premium decorative surfacing shift from evolution to REVolution since the early 1990s. The meteoric rise of solid surface and quartz surfacing has facilitated billions of dollars in sales as these products still embody today’s most sustainable value propositions. So here we are in 2018 with a decent and growing economy and a plethora of commercial and new construction business, and while there are some new products (mostly new brands), it seems to me that our industry is ripe for some substantial changes. When it comes to growth, I see plenty of horizontal strategies employed, and that alone could open the door for some positive vertical integration initiatives. Such a perpendicular shift in strategy qualifies as a substantial change. While change for the sake of change is not advisable, there is an extra degree of freedom gained from changing a significant dynamic (horizontal to vertical), and naturally, the degree to which it is planned and executed will affect the ROI. This extra degree of freedom reveals itself as synergy. This allows for such things as acquiring new routes to market, co-branding initiatives that yield free-demand creation, leveraging different industries and more control over the entire process. These highly sought after synergies are the vehicle to drive sales, growth and, ultimately, profits. 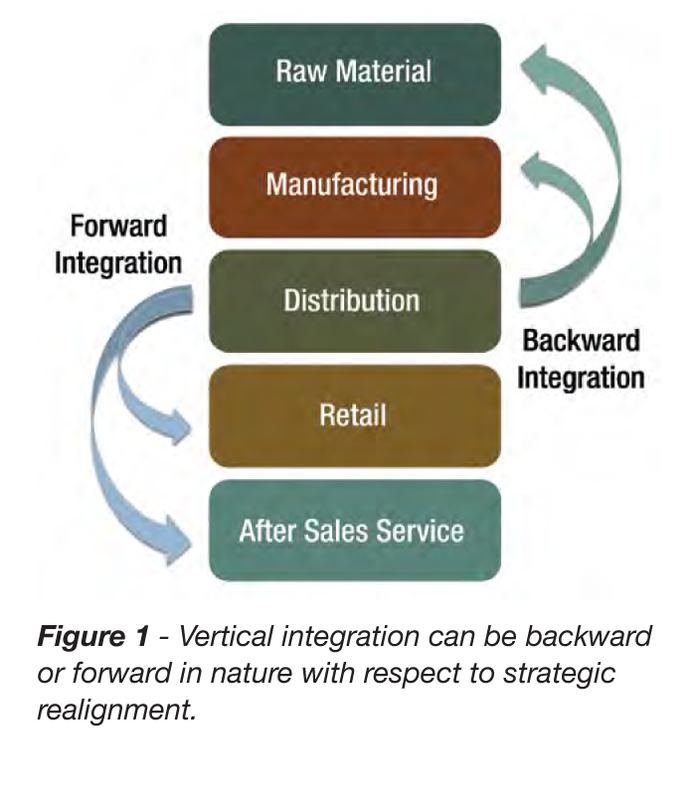 Vertical integration can be backward or forward in nature with respect to strategic realignment, so careful analysis is required to best position the change (see Figure 1). Note however that vertical integration strategies can invoke issues with core competencies, cash flow, real estate and labor acquisition, and there are hosts of other considerations that may require extensive planning. Major components of your decision will include: availability of integral assets, financial resource availability, relative strategic positioning, geography and forecasted synergistic leverage. Synergy is the end game. The co-branding, marketing, merchandising and designing of a company’s own products may be the industry’s most readily available, under utilized assets. Having a background in accounting and finance, I understand companies want to promote their most profitable assets one way and relatively less profitable assets another way, etc. These products may have vastly different manufacturing costs, raw material acquisition chains and positions in product life cycles. These dynamics are what tend to force manufacturers, distributors and fabricators to keep somewhat firmer lines of distinction in how they market and merchandise their portfolio of products. Using a more synergistic approach allows the assets of each product to complement each other so the value of their offering transcends a great product offering and into a great design solution. Solutions sell more than products, and ultimately you create trust, loyalty and even a dependency on you when solving a customer’s problems. For example, a manufacturer of both solid surface and quartz would benefit from a design brochure showing installs in myriad uses and in as many different spaces that highlight each asset’s core value. Why not show a radius reception desk cladded with thermoformed solid surface, perhaps backlit for some dramatic effect with a sculpted quartz countertop? The two materials are in respective settings that accentuate their core values. Going a step forward might be intentionally creating colors and aesthetics with the same or similar pigments or complementing patterns that are made to be used in conjunction with one another. This color complementary strategy provides such a high level of design synergy that it is basically an engineered exit barrier. A giant leap forward would be finding creative and tangential ways to incorporate more of your asset portfolio. For example, if you also produce a high-pressure laminate, architectural glass tile or even a sintered surface, you could create marketing literature that shows all the assets in one coordinated design space that optimizes the performance and aesthetics to fit the space used. This will provide not only a forum to display your products, but also a forum of synergy and power showing you command the space and offer a design solution. A similar strategy could be used at a distributor or fabricator level based on the products they offer, and the ROI on such a branding strategy could be extremely valuable, and as such worthy of a significant investment. By cross-designing and cross-marketing one’s portfolio of products, a company creates brand equity. You show novelty, leadership and offer design solutions, not merely products. Add to this anything proprietary about your products, such as performance, thermoforming capability, aesthetic exclusivity, some creative distribution strategy and so on, and now you have created a formidable story and value proposition. Leveraging ALL of your assets together effectively creates one giant asset. Markets are smart and efficient, and products will tend to settle into uses that best match their functionality. However, when products are at, nearing or past maturity, the level of return from historic ways of marketing declines. And short of pulling back on marketing to save money and increase margin, why not change the approach and use free energy as yielded by synergizing your portfolio of assets. Different times call for different measures. Synergy, Adaptation, Integration and Leverage, or S.A.I.L., are four points to champion. Leadership must always have an eye on what’s next and how to combat the numbness of historical marketing activities. It may be time for a change in what you do as much as how you do it. Remember that synergy is what fuels our sun and is the fundamental process by which all life is sustained. Therefore, if you desire greener pastures, you must S.A.I.L. into the sunset of change by riding the crest of the synergy wave!